This article deals with bike tyres. It’s very common that MTB cyclists only understand tyres used on mountain bikes, while road cyclists are well versed only in those ridden on road bikes. But in the end, it’s all just rubber tyres. So let’s sum it all up in case a colleague who has no clue about bikes asks you as a passionate cyclist to advise them on this matter. 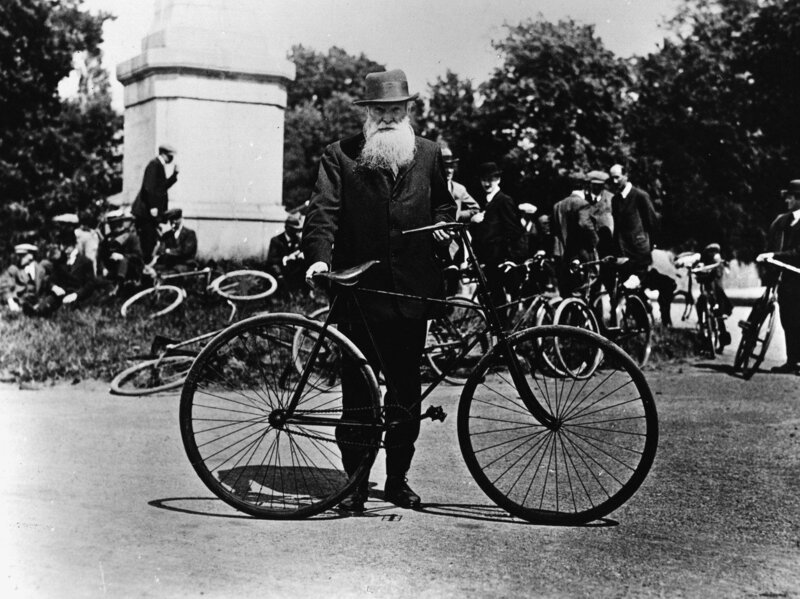 Everything started in 1888 thanks to a Scottish veterinarian named John Boyd Dunlop who could no longer stand the rattling sound of his little son’s tricycle riding on stones or the furrows the tricycle left on his manicured lawn. So he took a piece of rubber hose, attached it to the wheels, and inflated with air. The rolling resistance of the wheels decreased, making them much faster. Besides, the annoying rattle stopped and the garden no longer resembled a ploughed field. That year in December, Dunlop had his invention patented, and went on to fit the tube with a valve some time later. His pneumatic tubes soon replaced the solid rubber hoops used at that time, and it didn’t take long before his tubes succeeded in the world of racing. In 1890, Sport and Play magazine published an article arguing that Dunlop was not the first one to invent such tubes, stating that a similar principle had been devised by another Scot named Robert William Thomson. The news soon proved to be true, which resulted in Dunlop’s losing the exclusive rights, making the invention free to become widely used. The idea was taken up by the Michelin brothers, who upgraded the tyre with steam vulcanisation. That enabled them to make treaded tyres as we know them today. That happened more than a hundred years ago, and tyres have evolved a bit in the meantime. Thanks to the development in the field, road cyclists now have three various options to choose from: the classic tyre with an inner tube, the tubular, and the tubeless system. Another aspect to consider is the width of the tyre. The rubber compound the tyre is made of, the bead, the quality of the material used, or the tread pattern are some of the criteria you may also wish to take into account. Road cyclists mostly use classic tyres with inner tubes. This system is also known as clincher. It’s a well-known procedure: You put the tyre into the rim and inflate the tube. The tyre is attached to the rim with a special edge called bead. You can choose from two options, which determine how easy it will be to put on and take off the tyre and how easy-to-store the tyre will be. Wire bead tyres are the older and cheaper alternative. In this case, the bead is in fact a circular wire preventing the tyre from popping off the rim. The wire option will save your costs, but the tyre will be heavier and non-folding as the wire holds its circular form. For that reason, tyres with bead made of Kevlar fibres are a more convenient way to go. Not only is such tyre lighter, it can also be folded into a small bundle that is easy to transport. However, it may be a little more difficult to mount the tyre, and the price is higher, which are the two downsides of this alternative. 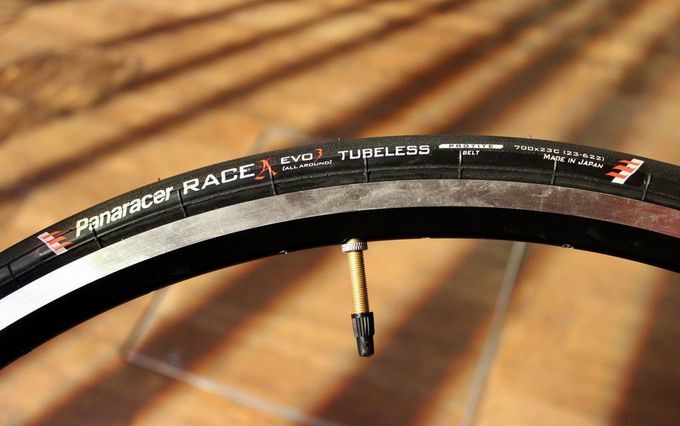 A tubeless tyre is a more advanced alternative which, as the name suggests, has no tube inside. 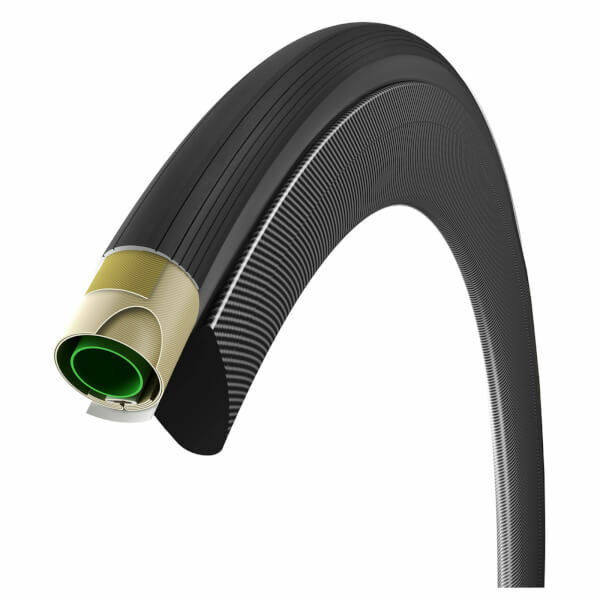 The rim and tyre are designed to be airtight without the need for a tube. The advantage of this option is the fact that there is no unwanted friction between tyre and rim. Thanks to this, tubeless tyres have lower rolling resistance than ultra-light racing tyres with inner tube. On top of that, tubeless tyres can be ridden at a lower pressure so statistically, the chances of a puncture decrease. Plus if you carry a special liquid to apply to the punctured tyre and instantly seal the hole, you get a very reliable option. 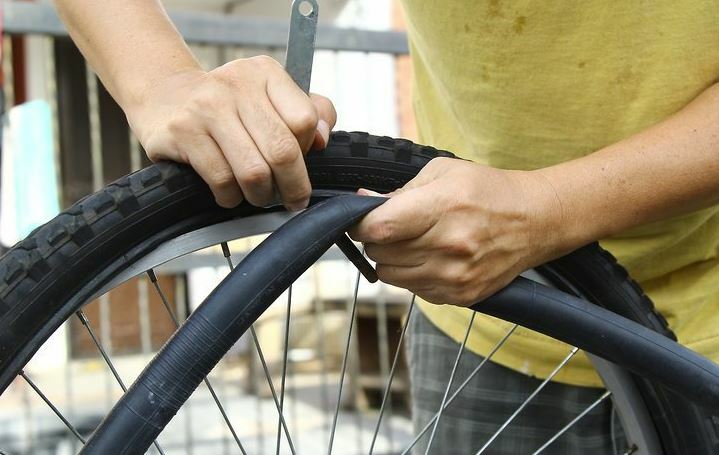 That said, some of you may be discouraged by the somewhat laborious and time-consuming installation or the fact that to use the tubeless system, you need a special rim and tyre. There are many deep-dyed road cyclists who still swear by the tubular, a tube stitched to a tyre, which is then glued to a special rim. Tubulars are still popular today because of their cornering and low rolling resistance. The truth is, however, that modern tubed tyres have caught up with traditional tubulars in these aspects, making such arguments far less important. On the other hand, an undeniable benefit of the tubular is its behaviour in case of a puncture. Even if the air escapes fast, it is still possible to ride the tyre as it is glued to the rim and won’t slide off. This enables pro cyclists to wait till the assistance car comes or to ride to a place where the puncture can be fixed. As there is no need for sidewalls to maintain pressure, the tyre is of low weight, which also speaks in favour of tubulars. On the other hand, manipulation with the tubular is a little difficult. It must be glued to the rim, which is much more laborious than mounting a classic tyre. What’s more, a tubular is harder to fix. In case of a smaller puncture the tyre can be fixed using a sealant; in all other cases the only solution is to buy a new tubular. Last but not least, a complex manufacturing process results in higher purchase costs. The most commonly used diameter is 622 mm, or 700c. This unit is a bit obscure today because it’s derived from old French measures. But surprisingly enough, it’s still in use in the world of cycling. By contrast, tyre width is not carved in stone. Both narrow and wide tyres have their benefits, and it’s up to you to choose the qualities that will suit your needs. A narrow tyre is useful at higher speeds as the air resistance is lower. In addition, the low weight of the revolving tyre makes for a better acceleration. This will sure come in handy if you need to step on it and break away from a group or catch up with it. When riding at a constant speed, the advantages of wider tyres become evident. They are considerably more comfortable, saving rider’s energy. Even professionals have taken a liking to wider tyres recently. The most commonly used tyre width being 23 mm, many bikers, including racing pros, now ride tyres of 24 or 25 mm in width. A tyre’s behaviour is also influenced by the compound it’s made of. Soft compounds have better adhesion so they better stick to the road. Unfortunately, they wear off quickly, and you’ll have to replace them more often. Today, road tyres are made of various compounds to achieve a decent roll-out, good cornering grip, and long durability. Every tyre has a specific TPI (Threads per inch) value, which indicates the density of the threads in the tyre casing. The higher the density, the higher the quality of a tyre. Such tyres have lower rolling resistance, good driveability, and better puncture resistance. A good portion of what you’ve just read also applies to mountain biking, except for the fact that looking for tubulars on mountain bikes would be a vain effort. Because of their fragility, tubulars would soon get punctured. In the past, mountain bikers had used wheels of 26 inches in diameter, but these have been largely replaced by bigger, 27.5” or 29” wheels. As it’s turned out, wheels with bigger diameters are much faster, with lower rolling resistance, but still easy to control. Smaller, 27.5” wheels are mostly used in disciplines in which the riders descend, such as downhill MTB or freeride. 29” wheels dominate racing disciplines that require some pedalling, like cross-country cycling, marathons, and stage races. By the way, this year saw the first use of 29” wheels in downhill MTB, and their premiere was quite promising. As it seems, size does matter after all. An important aspect of MTB tyres is toughness of the compound and the tread pattern. 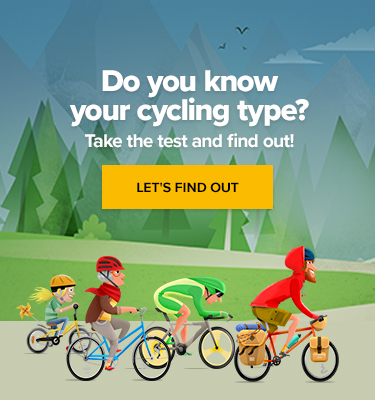 The reason is that mountain biking is much more universal, and the tyres are ridden on a wide range of surfaces, while road bikers mostly ride on… roads. A rule of thumb says that the more challenging the surface, the better it is to have a wide tyre with a deeper tread pattern. Recently, 27.5+ tyres resembling balloons have emerged. They are more comfortable, with better shock absorption and higher level of adhesion combined with a decent roll-out. Softer compounds stick well to a dry rock but wear off quickly. While biking in a city requires a smooth tyre with minimum resistance, riding such tyre on dirt or muddy roots when it’s raining is not a good idea. When riding in muddy conditions, it’s recommended to use tyres with deep tread patterns that get clean while the wheel is spinning. If you’ve ended up thinking there’s no fantastic all-purpose tyre for mountain biking, you’re damn right. While it’s fine to use just one tread pattern in usual conditions, riders who experience extreme situations, such as in downhill or bike park racing, carry various tyres in their cars and change them according to the conditions. Different strokes for different folks, so after all, everybody must find out what suits them best.